Ramco has experienced designers on staff to walk you through the cabinetry design process from start to finish. If you are building a new home, remodeling or finishing a basement, Ramco has many different options in wood species, door styles, finishes, and colors to help you get the space of your dreams whatever your budget may be. Ramco specializes in custom reception desks, buffet tables, and full bars to only name a few. Each piece is custom built in our fabrication shop. 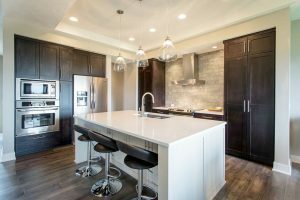 Ramco Enterprises is a cabinetry shop offering semi-custom and custom cabinetry for your specific needs, whether it be a residential or commercial project. Family owned and operated since 1985, Ramco designs and builds cabinetry with attention to detail, which sets us apart from others. We are commitment to the highest quality in all that we create. Such quality is achieved by using the most innovative fabrication methods and machines to build our frameless custom cabinetry. Ramco’s team is dedicated to earning your trust by our craftsmanship, customer service, honesty, and integrity.